The impact of currency moves on inflation have weakened in the 19-nation euro region, a European Central Bank study showed on Wednesday. 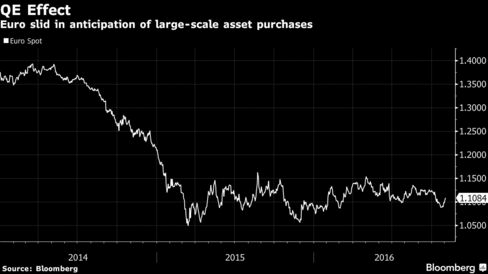 The report comes as the ECB is considering whether to extend its 1.7 trillion-euro ($1.9 trillion) asset-buying program beyond March amid stubbornly low inflation. Policy makers including President Mario Draghi have highlighted the importance of the exchange rate for price developments and growth, while stressing that they don’t have a target for the single currency. While headline inflation accelerated to 0.5 percent in October, the highest since mid-2014, it remained well below the central bank’s goal of just under 2 percent. The globalization of trade as well as the emergence of low-cost exporters in countries such as China may have reduced the impact of exchange-rate swings on prices, according to the study. The growing role of the euro as a currency in which imports are invoiced may have also helped weaken the link. Still, monetary policy can make a difference.